This recipe is the result of many years of trial and error. I have been doing them for so long now I don't even think about it any more. They take some time and patience but that's true of most everything that is really worth doing. You won't be disappointed. 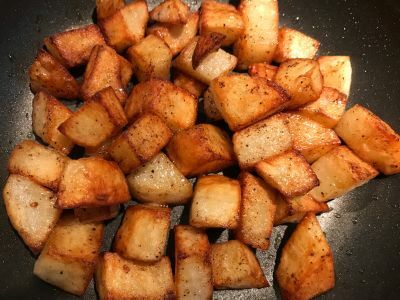 Most restaurants use shortcuts to make home fried potatoes. They will steam them the night before or some even use canned potatoes. And there is no way you can make a canned potato taste good. 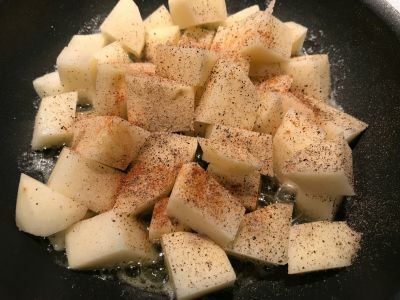 The steamed potatoes can be very good however and sometimes I will even do that if I feel like something different. That recipe will be coming soon. But for now, spend some time and try these. I have added a lot of pictures because the only thing you can really do wrong here is to use too much heat or not enough heat. And it's hard to not use enough heat because as long as they are sizzling at least a little bit you have enough heat. But play around with it. I will increase and decrease the heat multiple times during the cooking process and I'm sure after you do this several times you will do the same. 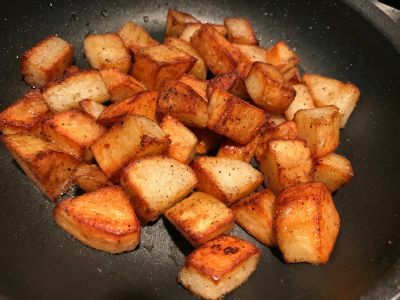 Have fun and I guarantee once you get the hang of this everyone will ask you to make the potatoes for breakfast! 1. Peel, rinse and dry the russet potato. 2. 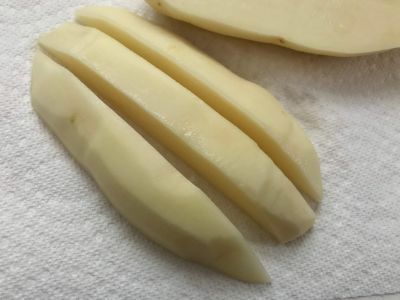 Cut the potato in half lengthwise along the narrow side. 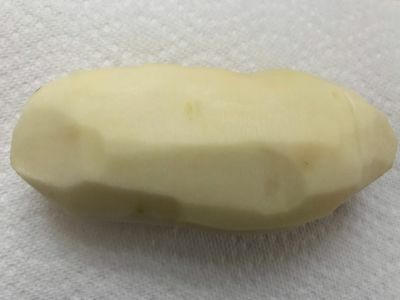 The potato has an oval shape when you look at it from the end. Place it so the oval is tall and narrow and then slice down the middle. 3. 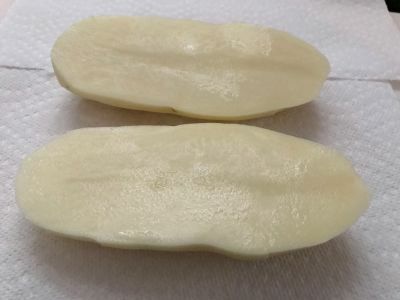 Slice the potato lengthwise into 3 sections. 4. 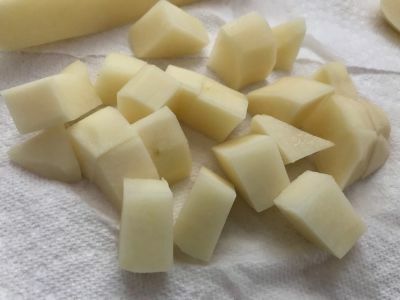 Now cut across the strips to make pieces of potato. This is not an exact science and they don't need to be uniform in size. In fact, I deliberately don't cut them equal because the little ones will get crunchier while the big ones are cooking. 5. 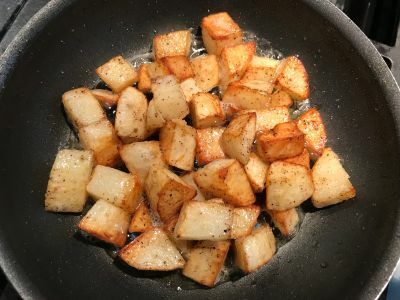 Add the butter and the olive oil to an 8" non-stick skillet. 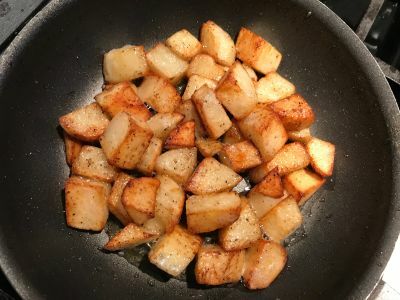 I always use a non-stick skillet for this because it is easier to "flip" the potatoes to make sure they cook evenly. And I have cast iron and high carbon steel pans but always go back to the non-stick for these particular potatoes. And the 8" pan is great for a single large potato. If you are doing more, go to a 10" pan. 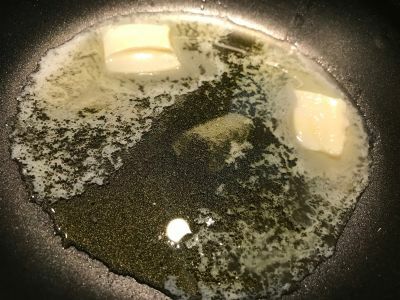 And quite often I just use butter here but oil and butter together work great also. 6. 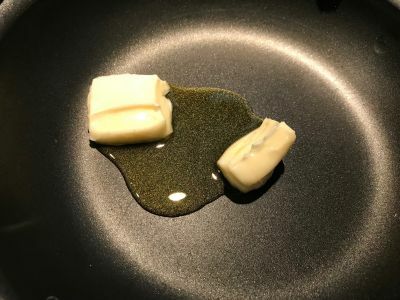 Turn on the heat to medium to melt the butter. We don't want any smoke here or any browning of the butter at this point. 7. 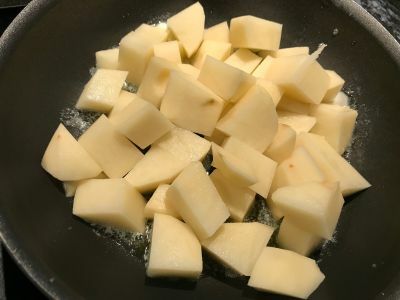 Add the potatoes to the heated pan. 8. 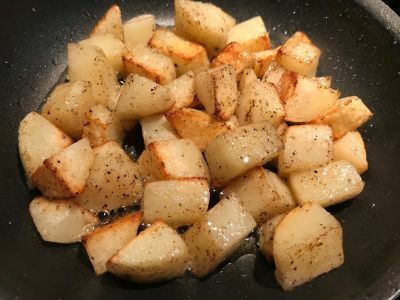 Grind as much black pepper onto the potatoes as you like. No need to overdo it, you can always add more at the table if necessary. And sprinkle a little white and red pepper on as weill. This is a classic cajun technique that will provide heat to the front of the mouth (black pepper), the middle of the mouth or the tongue (cayenne pepper) and in the throat (white pepper). Use as much or as little as you are comfortable with. Just remember, once you add it you cannot take it away. 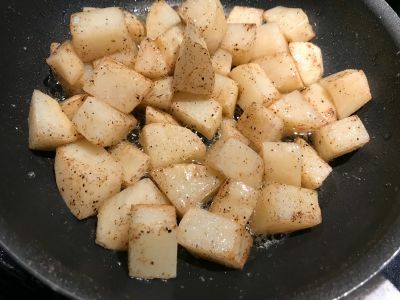 And I never salt the potatoes while they are cooking. I find they don't crisp as well. Salt them at the table. 9. 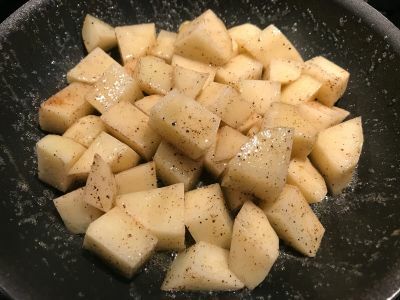 Now toss the potatoes to get them all coated with the butter and oil and let them get to cooking. They should be sizzling mildly but should not be in danger of burning. If they are getting too brown too quickly turn down the heat. I have provided pictures of about what they should look like at 5 minute intervals so you can judge whether your heat is too high or too low. And make sure you toss them either by flipping them (the best way) or just use a spoon or spatula to mix them around. 10. Now you can taste them and see if they are done to your liking. And also if there is too much oil in the pan, simply take a paper towel and wipe some of it out. A little left is good but if you get most of it out they will continue to crisp up. 11. They can stay on low heat for a little bit but keep an eye on them. They really should be eaten with 5-10 minutes of this time. You can put them in the oven but if you do they will soften and you will lose all that beautiful crispness. 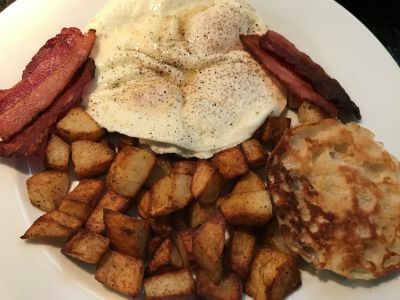 Now you are ready to serve them with bacon, eggs and english muffins for the best breakfast ever! Enjoy and let us know how you make them even better!